Our newest treat! Peanut Crunch is a delicious combination of peanuts, sugar, and butter...it's awesome. Give it a try. And, since it's packed in a 16 oz. resealable bag it's easy to share with friends and family. I love peanut brittle that is close to what I remember as a child and your Peanut Crunch is it !! Thanks so much! 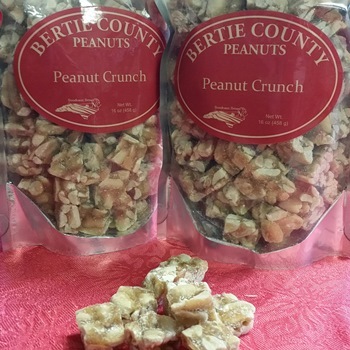 Feb 13, 2016 | By Mary W.
I have ordered twice from Bertie Co. Peanut Co. & both times I have been very please, as has my husband, with all their products. 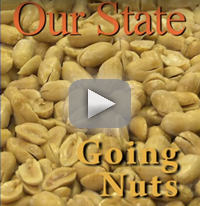 We love the peanut brittle. It is very tasty & not so hard it will break your teeth. I ordered a small jar to try it & quickly ordered more. We love it. We also love the raw peanuts in the bag. I cook them in the oven (like roasting them) & we love to snack on them and feel they are good for you-no grease or salt added. We also really loved the salted pecans. I have reordered them, too. The small jars make great gifts for friend & cost under $10. I love this co. & will remain a customer for years to come I hope. I highly recommend them to one and all! Wow! How good is that. Just theorist size pieces, just the right amount of ingredients, sweet but not too sweet with just a hint of salt-perfect mixture. This is the first time ordering this particular product and it is just as good of the rest of the products I have purchased previously. The peanut crunch were awesome. They were light sweet buttery taste and the resealable bag made them stay fresh. I highly recommend purchasing these peanut crunch and be sure to get extras because you are going to want more and it's difficult to share. this is not peanut brittle. This stuff is awesome. Great. This must be the best peanut brittle pieces I have ever had. 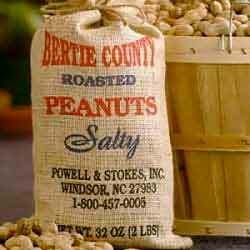 Not too sweet, airy and easy to eat plus filled with the great peanuts from Bertie County!